After hearing some of their grooves, I knew this was the right analog bass synth for my compact studio. It produces some really grimy, deep and dark bass lines, and bonus: it’s Ableton-friendly. First things first: analog gear is new for me. When I first got turned on to music production, I really thought I’d be staying completely inside the box. My entire experience has been limited to various VSTs. I’m sure I’m not alone here: gear is expensive, often “limited” (er, focused) in terms of onboard patches, and takes up space – space I don’t really have. 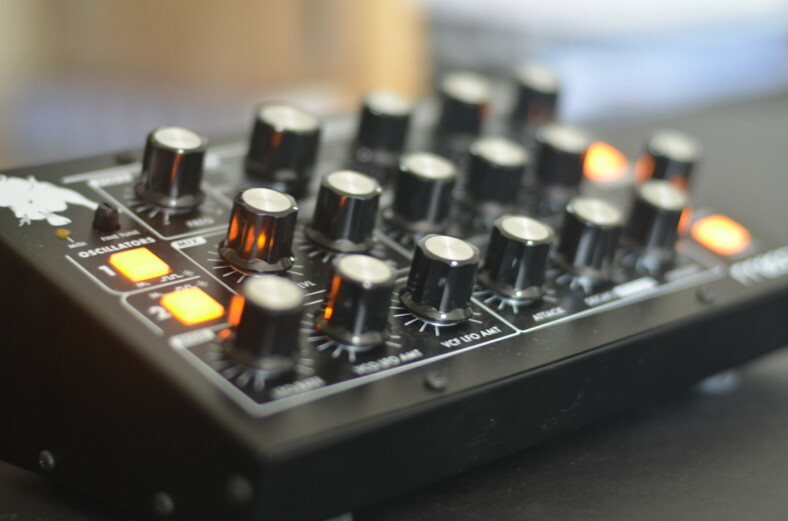 From moody synth stabs to deep sustained grimy lows, the Minitaur’s size is perfect for a bedroom studio. My studio consists of a 5×3′ table, with some 10″ shelves to vault my display and monitors. At only 8″ wide, and raking up to 4″ tall, the Minitaur is smaller than a box of tissues. Aside from the AC adapter, I’m using the USB cable for MIDI, sending back mono 1/4″ audio. My only hardware complaint is that it does not have a power switch on it – you have to yank the AC to power down. Getting the Minitaur to perform properly with Ableton wasn’t easy – at least, so I thought. Thanks to Moog Support and a hundred Google queries, I finally got it solved. My other post here details the Minitaur setup process for Ableton. 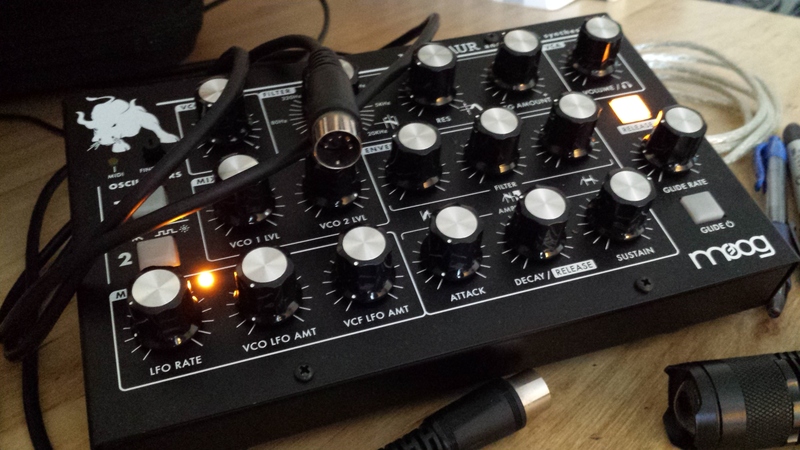 The Minitaur is a great way for Ableton VST junkies (like me) to get hands-on with warmer analog sound. Take a listen to this early recording I made, just tweaking thru the knobs here. Talk about potential. The Minitaur is available for sale here.